“Creativity is allowing yourself to make mistakes. Design is knowing which ones to keep”. Dilbert is an American comic strip written and drawn by Scott Adams. First published on April 16, 1989, Dilbert is known for its satirical office humor about a white collar, micromanaged office featuring the engineer Dilbert as the title character. The strip has spawned several books, an animated television series, a video game, and hundreds of Dilbert-themed merchandise items. 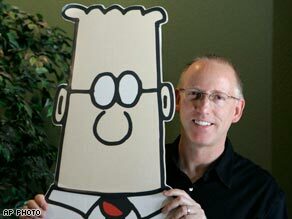 Scott Adams, born June 8, 1957, is the creator of the Dilbert comic strip. His Dilbert series came to national prominence through the downsizing period in 1990s America, and then was distributed worldwide. A former worker in various roles at big businesses, he became a full-time cartoonist in 1995. Adams writes in asatirical, often sarcastic way about the social and mental landscape of white-collar workers in modern corporations and other large enterprises. Click here to view the official website. (About Dilbert Comics). His work was recognized and won awards such as National Cartoonist Society Reuben Award and Newspaper Comic Strip Award for 1997. In this Dilbert Comic Strip, character 1 states that someone told him that Dilbert’s presentation was confusing and unpersuasive and technically it didn’t sway the audience. Dilbert answers in such a way by saying that sometimes a person’s ability to understand tends to look like another person’s inability to explain. Character 1 states that he didn’t really understand what Dilbert had just said. 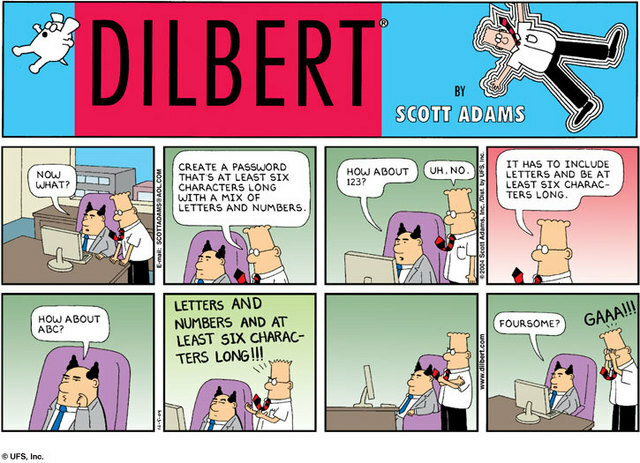 And Dilbert just proved his point there itself. In this Dilbert Comic Strip, the unmotivated sales guy is actually being honest about his current situation, by telling his audience that he couldn’t present because his slides were blank and no one had told him the actual details about his product. The writer Scott Adams is trying to state that in a company an employee only gets motivated to work when he finds out his getting commission out of it. Employees tend to work so hard in order to get their commissions or extra credits. Hence motivating an employee in a company will prove to be a success, by helping both the employee and the company. In this Dilbert Comic Strip, sadly, there are too many organizations that just try to copy Toyota instead of really understanding what’s behind the Toyota Production System. In this Dilbert Comic Strip, the boss announces that the staff members are going to get into the computer tablet business, but they won’t be producing it, some other company was assigned to that job, and they are instead being assigned to design the logo. In this strip the issue of Outsourcing has been raised, and shows how it has become very common in today’s business world. Usually in company’s, some employees don’t really have any work to do, instead they just laze around. Scott Adams makes fun of how companies do accept Outsourcing. In this Dilbert Comic Strip, this philosophy embraces the concept of “no problems is a problem” Scott Adams has shown us that we have to uncover and understand the root cause of our problems. But in order to do that we must first admit to ourselves that we have a problem and face it.